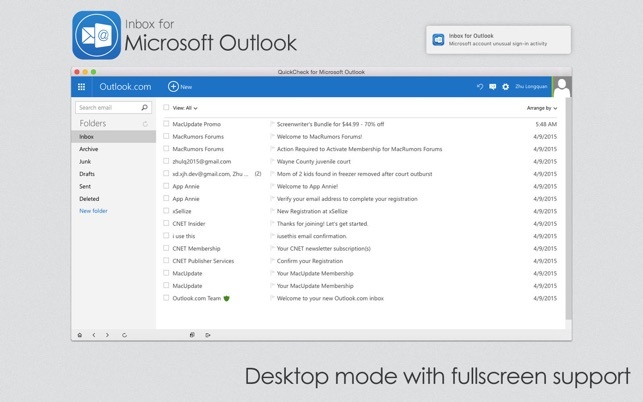 Inbox for OUTLOOK that gives you fast and instant access to Outlook, Hotmail and/or Live mail directly from your toolbar. Keep up to date with your mail faster than ever. It is the ideal app for instantly accessing your Outlook email accounts (including Hotmail) without having to open your web browser. Just click the icon in your toolbar and sign it with your Outlook/Hotmail/Live account, its that simple. You can either run the app with a dock icon or without. 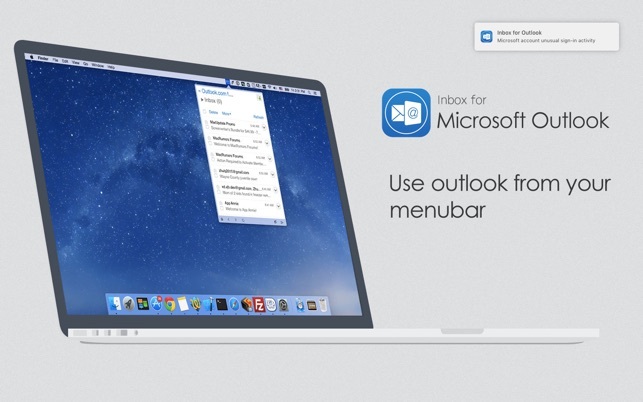 Legal Note: Inbox for Outlook is a 3rd party app and is not affiliated with Microsoft what so ever. Outlook & Hotmail and its logo is trademarkes of Microsoft Inc.
Bought this product thinking that it would make working from home a bit easier. However, I was dead wrong. DO NOT BUY!!!! This product is a waste of 5 bucks. It’s very confusing to work and the interface is poorly designed. When you try to pull up a window from behind the program, the program doesn’t hide in the background. You have to literally minimize it every time you need to switch windows. I am a tech savvy person and I struggled to find the good in this program. It is more time consuming than it is useful. Again, DO NOT BUY. Program doesn’t hide, you must minimize it every time you need to pull up a new window. Settings are not user friendly to change. I want to give it two stars because it’s a good concept and I do get my work emails, but i just can’t. I’m just disappointed and what they tried to do here. Can’t download attachments…basically makes it useless. Simple enough to set up, but visually it doesn’t look especially great, particularly when using the quick access icon from the header. And there is limited options to change font size, format etc. But the real issue is I can’t download any attachments from e-mails. It just goes to a blank screen and stalls. This pretty much makes the app useless and I am now having to go back to accessing e-mail through my web browser, which at least works fine. I have sent feedback, awaiting response. Disappointed. The lastest updates fixed earlier issues I had with the application (downloading attachments, [not] opening new window for links, etc.). I use this for personal emails and it now definitely works fine for me. I will tell you when I get a job whether or not it is good for business purposes. But it is fine for my everyday use.